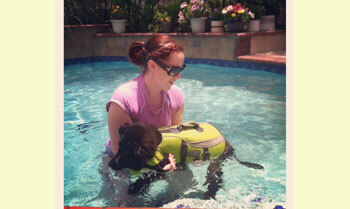 Aries Is Taking Swimming Lessons! This silly lil boy has stolen our hearts and has quickly become a favorite at doggie day care. He really loves his tennis balls, playing in the water and hanging with his new GSD big brother. Recently we took him to a friend’s pool for some swim lessons and boy did he enjoy that! Everywhere we go people just think he’s the cutest puppy; once we even had a line of people wanting to say hi! I really can’t imagine life without him. Thanks!